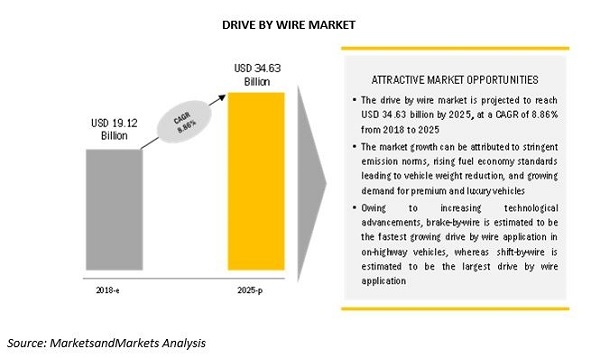 [205 Pages Report] The drive by wire market was valued at USD 17.49 billion in 2017 and is projected to grow at a CAGR of 8.86% during the forecast period and reach USD 34.63 billion by 2025. Nowadays, the automotive industry is more inclined to use advanced technologies to increase the fuel efficiency, reduce the emission levels, and enhance the driving dynamics of the vehicle. Increase in emission limits leading to vehicle light-weighting trend and increase in demand for premium and luxury vehicles to drive the drive by wire market. A drive by wire is a system where the mechanical components are replaced and controlled by sensor technologies. Sensors record the information and pass the data to a computer or a series of computers that convert the electrical energy to mechanical motion. This technology eliminates the need to use conventional components such as drive-belts, drive-shafts, pumps, vacuum boosters, and master cylinders. Instead, it uses electric motors and electro-mechanical actuators to execute the functions carried out by the conventional mechanical or hydraulic components to meet the requirement of weight reduction and improved vehicle performance. The major factors restraining the growth of the drive by wire market are the high incremental cost, risk of failure in electronics, and lack of public acceptance. 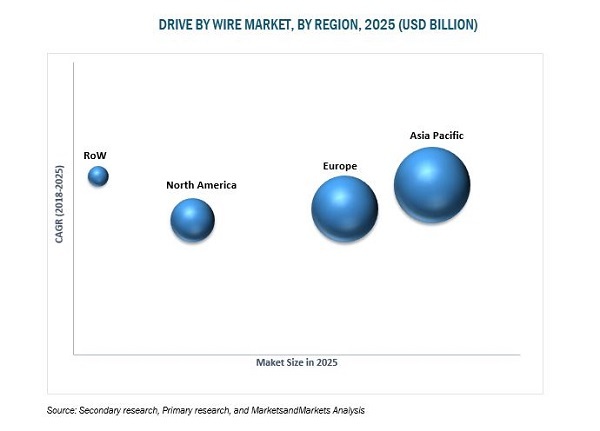 Furthermore, the ongoing new product developments and partnerships by leading companies are likely to propel the growth of drive by wire market further in the untapped market for the long forecast. The research methodology used in the report involves various secondary sources such as association of equipment manufacturers, the US department of transportation, environmental protection agency, automotive parts manufacturer's association, and the society of Indian automobile manufacturers, among others, including paid databases and directories. Experts from related industries and suppliers have been interviewed to understand the future trends of the drive by wire market. Extensive country-level model mapping was carried out to capture the installation of applications such as throttle-by-wire, steer-by-wire, shift-by-wire, brake-by-wire, and park-by-wire. Model mapping was carried out by considering all the vehicle segments—passenger cars, LCVs, trucks, buses, and electric & hybrid vehicles. For deriving the market size in terms of volume, the penetration of the number of applications was multiplied by the production number of specific countries. For country-level value market, the volume was multiplied by the average OE price of a single application. Adding the market sizes of each country of that particular region gave the regional market size. Further, the summation of regional markets gave the global market size. Dealers and distributors of drive by wire systems and technology suppliers were contacted for reference. The figure given below shows the breakup of the profile of industry experts who participated in primary discussions. The drive by wire market is dominated by a few global players and comprises several regional players. Some of the key manufacturers and suppliers of the drive by wire market are Bosch (Germany), Continental (Germany), ZF (Germany), Infineon (Germany), Nexteer (US), CTS (US), Ficosa (Spain), Kongsberg (Switzerland), Hitachi Automotive (Japan), and Curtiss-Wright (US). Why shift-by-wire has the largest market today and will also dominate the future as well? How and why brake-by-wire and steer-by-wire are the fastest growing drive by wire systems? The drive by wire market, by value, was estimated to be USD 19.12 billion in 2018 and is projected to reach USD 34.63 billion by 2025, at a CAGR of 8.86%. The major driving factor is the increasing number of mandates by governments to control vehicle emissions and the demand for passenger comfort. The drive by wire technology helps in achieving that by reducing the weight of the vehicle, and thus, increasing fuel efficiency. 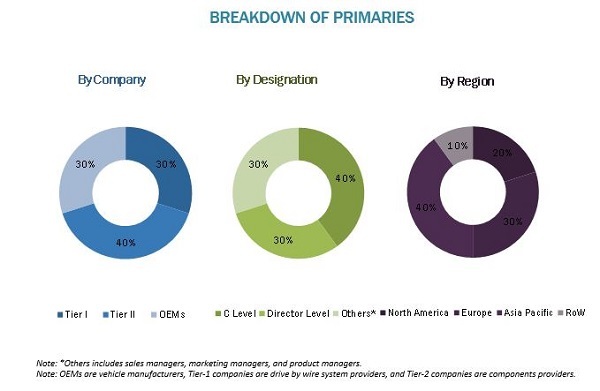 The drive by wire market has been segmented on the basis of application, sensor type, component, on-highway vehicle, off-highway vehicle, electric & hybrid vehicle, autonomous vehicle, and region. On the basis of on-highway vehicle type, the passenger car market is the largest in terms of volume and value. This is attributed to the increasing demand for passenger cars with advanced systems in developed and developing countries. The passenger car segment is witnessing the highest sales of premium and luxury vehicles equipped with drive by wire systems offering high performance along with safety and comfort features. Brake pedal sensor is estimated to be the fastest growing market for drive by wire market, by sensor type, during the forecast period. This sensor is placed in the brake-by-wire system that offers vehicle safety compensation for driver errors or delayed reaction times. Hence, with the increasing demand for drive by wire, the market for brake pedal sensor is expected to increase. The electronic control unit (ECU) is estimated to be the largest market for drive by wire, by component, owing to its usage in every drive by wire application and its higher cost compared to other components makes it the highest market. In the off-highway vehicle segment, agriculture tractors are the fastest growing as incorporating an electronic system would eliminate many mechanical parts, thereby reducing the overall weight of the tractor and automatically increasing fuel efficiency. Also, these system offers better comfort, safety, and performance in these vehicles. Additionally, the increasing trend toward autonomous off-highway vehicles such as autonomous tractors and mining equipment has led to the tremendous growth of drive by wire systems in these vehicles. The growing demand for autonomous vehicles would also fuel the demand for drive by wire systems as vehicles will be fully equipped with drive by wire systems because of the fact that these vehicles use electrical and electronic intelligence while driving. In the electric & hybrid vehicle segment, HEVs have the largest market share in terms of value. HEVs are premium vehicles in terms of their price range and features offered, and thus the high cost can be compensated by offering drive by wire systems in these vehicles. Asia Pacific is estimated to be the largest market for On-highway vehicles during the forecast period owing to the increase in the consumer purchasing power and their preference for better safety measures and the need for higher fuel efficiency of the vehicle. Also, as the Asian countries plan to standardize emission norms and use an increasing number of electric vehicles in the future, drive by wire systems are likely to get traction. North America and Europe are also known for having the largest market owing to the reason such as it has the largest market for passenger cars, particularly for premium cars (C segment and above). The demand for premium cars has accentuated the need for less emission and lower vehicle weight, which can be achieved with the help of drive by wire systems. With the increase in the sale of premium cars, the demand for efficient drive by wire systems is increasing so as to improve the vehicle performance and comfort, and this is further driving the drive by wire market in these regions. The major factor restraining the growth of the drive by wire market is the high incremental cost, risk of failure in electronics, and lack of public acceptance. The major players in the drive by wire market are Bosch (Germany), Continental (Germany), ZF (Germany), Infineon (Germany), Nexteer (US), CTS (US), Ficosa (Spain), Kongsberg (Switzerland), Hitachi Automotive (Japan), and Curtiss-Wright (US). *Details On Overview, Products Offered, Recent Developments, And Swot Analysis Might Not Be Captured In Case Of Unlisted Companies.